Applicable worldwide: USA, Australia, China, Brazil, Russia, in most European countries such as United Kingdom, Croatia, Finland, Germany, Hungary, Iceland, Poland, Slovakia, Sweden and in more than 190 other countries. 1x USB port easily charges smartphone, tablet or other USB devices. Input plugs: Europe (Schuko & 2-pole Euro), Australia/China, UK, USA/Japan, Switzerland, Italy, Brazil. Output plugs: Europe (Schuko), Australia/China, UK, USA, Switzerland, Italy, Brazil. 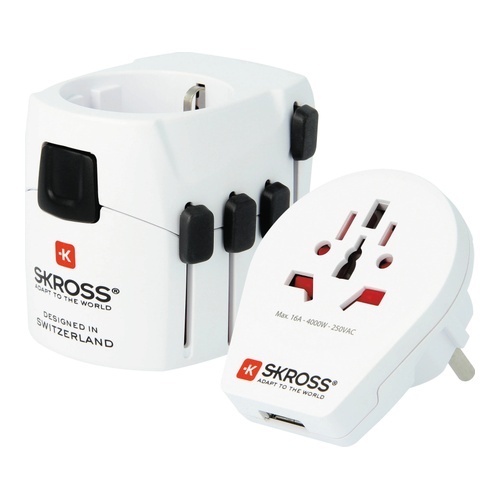 With our powerful universal adapter you are perfectly equipped for numerous adventures around the world.